Come Blow Your Horn is Neil Simon’s first play about when he finally left home and moved in with his older brother. The play is very different from the movie. I am not knocking the movie. I really loved it. I mean how can you go wrong with Frank Sinatra, Tony Bill, Lee J. Cobb and Molly Picon. It is a fun movie, a bit of a romp. I saw the movie before I saw the play. My Grandma met Molly Picon, she was from the Yiddish Theater and my Grandmother and her family used to supply fabric for the costumes for the Yiddish Theater. She had met Molly and her mother when they came in to buy material and my Grandma used to tell us great stories about it. So i have soft spot for this wonderful and funny lady. The movie also had Jill St James and Barbara Rush who I also admire, in fact there really isn’t anyone in the cast that I didn’t admire. I also think that Norman Lear who wrote the screenplay is an amazing writer and producer, ( I grew up watching all his TV Shows and they were all the type of shows that pushed boundaries and taught while they made you laugh,) but he is a different man with a different life from Neil Simon and he gave the movie his own take and it was very different then Neil Simon’s vision. I saw the play in the 80’s and I was surprised by how different it is. It is a sweet charming and very Jewish Play. It was what they did to his first baby that convinced Neil Simon that only one person could make his plays into screenplays from then on is Neil Simon. So from then on he always wrote the screenplays when his plays left the foot lights and went on to the big screens. Come Blow Your Horn is all about growing up and finding your path to adulthood. I guess it shouldn’t be a surprise that it led one of the best playwrights of our time to grow as an artist. Actually I kind of love the idea of that, don’t you? 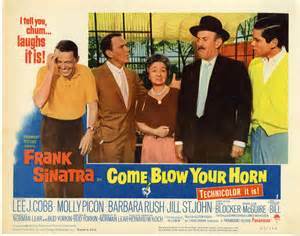 This entry was posted in Barbara Rush, Come Blow Your Horn by Neil Simon, family film, favorite, Frank Sinatra, humor, Jill St John, Lee J Cobb, Molly Picon, movies, Neil Simon, Tony Bill and tagged classic movies, family film, family movies by rithebard. Bookmark the permalink.